Sponsored in part by Philadelphia Water and hosted by the non-profit Schuylkill River National and State Heritage Area (SRHA) since 1998, the Sojourn draws paddling enthusiasts, environmental advocates, history buffs and more while showcasing the scenic and natural splendor of a river that provides drinking water to more than 1.5 million people and contributes well over a half billion dollars to the local economy annually. Laura Catalano, a spokeswoman for SRHA, says the 2016 trek was the most popular ever: an average of 110 people were on the water each day, and a record 79 participants made the full trip, which lasted from June 4 to June 10. On the final leg, 115 Sojourners made their way from West Conshohocken to Boathouse Row above Philadelphia’s Fairmount Dam. 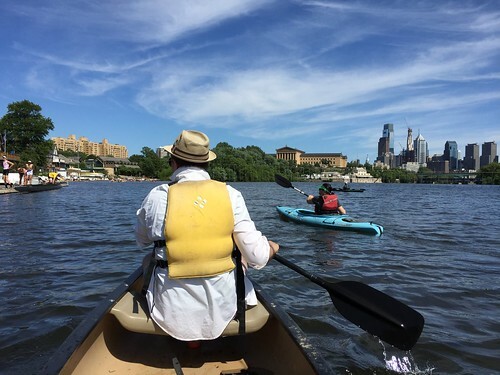 That more and more people are taking part in this epic celebration of the Schuylkill is no surprise to those in the know—thanks to efforts from organizations like Philadelphia Water and many, many others, this river has been making a spectacular comeback for years. Much to the delight of the Schuylkill’s fans, the secret of this gem is officially out. Having intimately sampled the health of the river each year since 1998, he’s watched the recovery firsthand over a long period of time. With visibly less pollution have come more wildlife sightings and a greater diversity of wildlife. Raring’s current tally of river life includes freshwater clams and mussels, (lots of) bald eagles, ospreys, beaver, otters, mink, ducks, swans, geese, different heron species and an abundance of fish, including trout—one of the most pollution-sensitive fish in nature. There are also many more people now enjoying the natural and recreational qualities of the river; Raring and others have noticed an uptick in people fishing, kayaking, canoeing, tubing, birdwatching and more. Fellow Sojourner Michelle Hnath, of Reading, Pa., is also impressed with the growing wildlife. She’s completed 11 trips over the years and notices more bald eagles each time she paddles south to Philadelphia. “To me, the eagles are a sure sign of the water quality improving,” says Hnath. For those who still think of the Schuylkill as a place to be avoided, Raring says they need to come out and see the change for themselves. To be sure, there are still plenty of challenges. During this year’s trip, local writer Bradley Maule documented the issue of litter and trash that gets swept into the river from urban areas by rain storms—one of the more visible problems—on his Philly Skyline blog, thanks to the Schuylkill Action Network’s Schuylkill Steward sponsorship. Maule drew praise from the watershed stewardship community last year with his One Man’s Trash exhibit at the Fairmount Water Works. A collection of litter pulled from Wissahickon Valley Park over 365 days, the display put a spotlight on the trash problem in our local parks and watersheds. You can read his daily Sojourn log and see some great photos from his trip here. Raring says that people who want to help with trash along the Schuylkill should get involved with local groups like the Schuylkill Action Network, the Schuylkill Headwaters Association and SRHA. Local volunteer cleanups are often posted on our events calendar. Catalano, of the SRHA, says the Sojourn is an invaluable tool for getting people invested in the Schuylkill, which translates to more people involved in cleanups and other efforts to protect the river. With a growing number of people signing up—Sojourners have come from 25 states and four countries over the last 18 years—it looks like the Schuylkill is set to gain more life-long friends like Raring, Maule and Hnath. If that comradery means a few hundred more Schuylkill river cheerleaders each year, prospects for an even brighter future are looking good for this priceless local treasure. To learn more about the Sojourn and participate in stewardship events, check out the SRHA site and our partnerships page.